Donna came to Hill Rise House in 1990 as our maid. It soon became clear that our property manager was not taking proper care, so we asked Donna to take over management responsibilities in addition to her maid services. She has a signature on our bank account and takes care of all the wages, Social Security, utilities, and repair bills. She is the first person our guests can turn to, if they need help and advice. Thank you Donna for your loyalty! We first met Bernard (Robbie) when he was working for our building contractor in 1989. After a few years, his boss was short of work, so we took the opportunity to offer him a job as full time gardener. 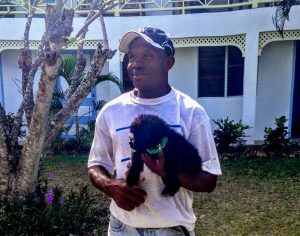 Over the years, he has learned a lot with our help, and help from his father who is a gardener on the Golden Rock estate. He loves to chat with our visitors. Thank you Bernard, for all your hard work! 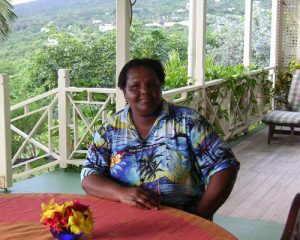 Donna, is responsible for the general management and the owner is usually only a phone call away. Donna, will come in every morning (at variable times) except Sundays and public holidays to make the beds and generally tidy up. She has no fixed hours. Are there the services of a cook? Donna is an excellent cook. She can prepare a meal for you at a service charge per meal plus the actual cost of the food. There is no need to make any arrangements in advance of your stay, unless you would like a meal prepared for the evening of your arrival. Otherwise, please discuss your requirements for lunch and/or dinner after your arrival (sorry, no breakfasts). Please do not ask Donna to prepare food (cleaning fish, vegetables, etc.) unless you have an understanding with her as to how much she will be paid. Please see Cooking Service Charges. Donna, will launder anything that does not require special care. There is no formal charge. Yes, by outside contractor twice a week. Yes, Bernard works on weekdays from 7.00 am to 3.30 pm. If his activities disturb you, please have a word with Donna. Do I need to give tips to the staff? Of course this is entirely up to you. If you have been well looked after, tips at the end of your stay are much appreciated. For guidelines, please contact us. Catering for non-resident guests - Depending upon the circumstances, Donna may wish to charge more in respect of additional responsibilities if you are planning to host a party. If you are planning on more than about 10 people, please discuss your plans with us. It might be better to bring in outside caterers.